With BackupBuddy, you can enjoy automatic WordPress backup for your site. Once your schedules are set up within the BackupBuddy plugin, your backups will run automatically at your customized, scheduled intervals. BackupBuddy’s Schedule’s offer a ton of schedule options. 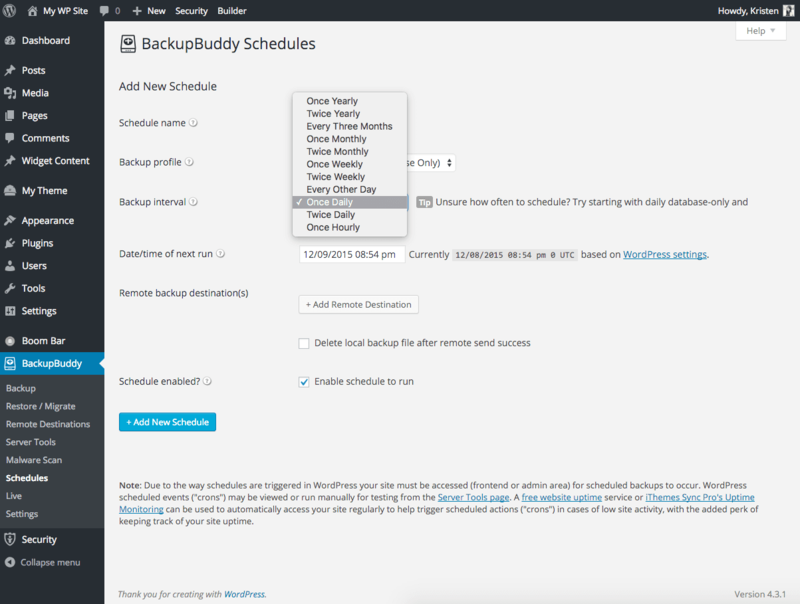 Once you install BackupBuddy on your WordPress site, visit the Schedules page. This feature helps to create a consistent amount of time between each backup without having to remember to login and manually create the backup. BackupBuddy also allows you to automatically send backups to a remote destination, such as Google Drive, Dropbox or BackupBuddy Stash. From the Schedules page, you can select from the available remote destinations you have already created or create a new one. You can also decide if the local copy of your backup is deleted after it has been successfully sent to the remote destination of your choice. We recommend scheduling your WordPress automatic backups for times when traffic on your site is light. The following are recommendations for Database Only and Complete (Full) Backups. Database Only Backup: Weekly – We recommend performing a Database Only Backup to back up your database on a weekly basis, since your database changes much more often than your files and folders. Complete (Full) Backup: Monthly – BackupBuddy recommends doing Complete (Full) Backup every 2-3 weeks, since your files only change when you add or upgrade plugins, themes or your WordPress version.